As we head into the summer months we are seeing a healthy jump in inventory in our area. In May, we saw the biggest jump in new listings in a decade! Price appreciation has created this phenomenon, motivating many people to make big moves with their equity. In fact, prices are up 11% year-over-year. We currently sit at 1.4 months of inventory based on pending sales. This more-equal balance of homes for sale compared to the first quarter has created great opportunities for buyers, finally! While it is still a seller’s market, it has eased up a bit. The average days on market in June was 21 days and the average list-to-sale price ratio was 101%. North Snohomish County real estate has been an affordable option compared to “in-city” real estate. In fact, the median price in June was 86% higher in Seattle Metro. Sellers are enjoying great returns due to buyers choosing to lay down roots in our area, and buyers are securing mortgages with minor debt service due to low interest rates. The easing of inventory is a welcome change and is helping to temper price growth. 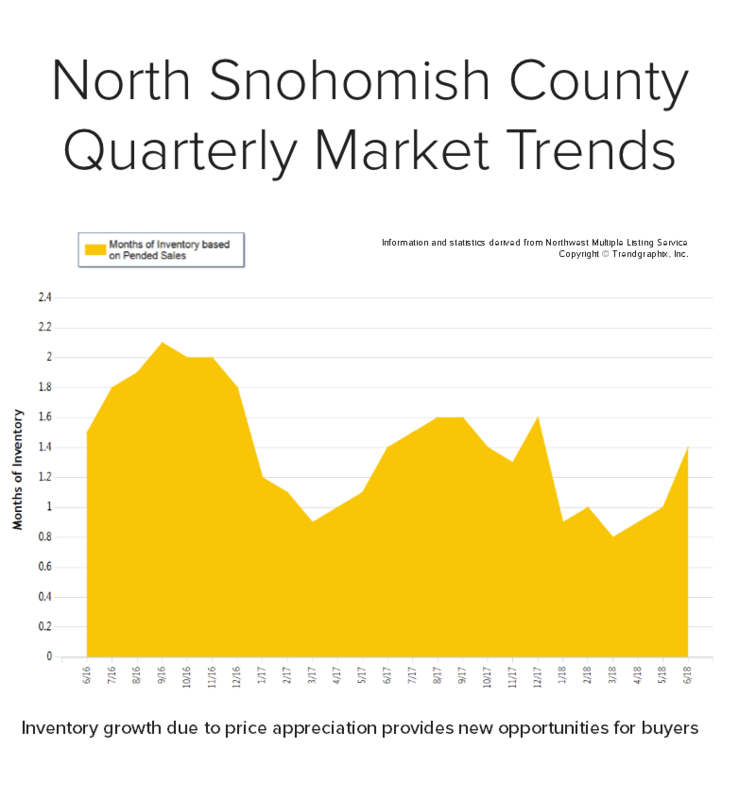 This is only a snapshot of the trends in north Snohomish County; please contact us if you would like further explanation of how the latest trends relate to you.